Sunday Salon: Planet Germany here I come! 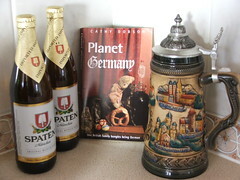 With only 16 days to my next trip to Munich, expect a little more Germania than usual around here. I’ve been pacing myself with just a smattering of German literature so far this year. However, I reckon that now is the time for full-scale indulgence. Aldi stocking my favourite German beer is a great aid to the prerequisite training program … and, on a more cerebral note, I have no less than 3 German novels on the go …. If you’ve been paying attention recently, you’ll have noticed Cathy Dobson’s Planet Germany placed at the top of the current reading widget for a number of weeks. The length of time there, not a negative reflection on the book. It was making me irritable with longing and envy, and so I needed to read it in very short sections for a while. But now that the gloves are off so to speak, I raced through the remaining 3/4’s in just two evenings last week. After a decade of living in Germany, Cathy and her ex-pat British family finally decided to fully integrate, adopt German tradition and participate fully in its customs. Planet Germany details their (mis)adventures during that year of total immersion in all things Germanic. Chaos rules in Cathy’s rambling farmhouse and converted pigsty as she deals with the manic cocktail of three school-age children, a herd of cats, including one megalomaniac tom, and the multitude of German bylaws. However, for every bylaw imposing Ordnung, such as one that prevents disposal of bottles in a bottle bank during lunchtime and another that imposes a maximum height on pine trees, there is a good excuse for a party: New Year, Karneval (when the whole of Germany dresses up in fancy dress), May Day, St Martin’s Day ….. Many thanks to Cathy for sending me a copy of her book. It brought back many, many memories …. including one of a Fasching (fancy-dress) party in which everyone from the office turned up dressed as me ……… fortunately for the guilty, that was in the era prior to the advent of digital photography! Thank you Lizzie – that’s a beautiful review of my book! I really enjoyed reading it and I’m glad Planet Germany put a smile on your face. Have a wonderful trip to Munich… and do remember to keep a weather eye out for dachshunds (and slugs). I lived in Germany for 4 years, so I think I’d like to read this book. I agree with Cathy about the German food; I found it to be quite heavy and way too “meaty.” I mean, come on, bloodwurst…gag! The pastries were delish though! I got really drunk on Spatenbrau at Oktoberfest and puked all over a guy’s shoes when I was trying to make it to the bathroom. When I think back on it, the time I spent in Germany was the “earthiest” time of my life, probably because the Germans are such earthy people. You’ll have a great time. P.S. — Be careful on the autobahn. A warrant officer that lived in our building was killed in the fast lane about 2 weeks after his arrival. His wife and kids hadn’t even shipped over yet.